Jonathan Woods did not run for re-election after his Arkansas Senate term expired in January 2017. The Republican is charged with trading government grants for kickbacks. (CN) – With another Arkansas lawmaker’s guilty plea already in hand, federal prosecutors unveiled fraud charges against a state senator they say took bribes. 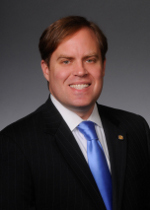 Jonathan Woods, a Republican, joined the Arkansas Senate in 2013 after three terms in the House. The 39-year-old lawmaker’s term expired this past January, just as his accused co-conspirator, former state representative Micah Neal, pleaded guilty to a conspiracy. Federal prosecutors say Woods and Neal are responsible for directing approximately $600,0000 in government grants to nonprofits whose officers paid them kickbacks. Filed with a federal judge in Fayetteville, Arkansas, the March 1 indictment against Woods names two of those officers as co-defendants: consultant Randell Shelton Jr. and Oren Paris III, president of Ecclesia College. Ecclesia received $200,000 in “general improvement funds” from the government thanks to Woods, and another $200,000 thanks to Woods and Neal together, prosecutors say. Acting Assistant Attorney General Kenneth Blanco and U.S. Attorney Kenneth Elser say Woods directed the Northwest Arkansas Economic Development District funnel money to the agencies of those bribing him. Woods faces 11 counts of honest services wire fraud, one count of honest services mail fraud and a single count of money laundering. Paris, 49, and Shelton, 37, are each charged with nine counts of wire fraud and a single count of mail fraud, respectively. To cover their tracks, Paris allegedly directed some of the grant money to Shelton’s consulting firm. Prosecutors say Shelton kept some of the money for himself and distributed the rest to Woods and Neal. Another part of the kickbacks involved Paris getting Woods’ friend an administrative position at the college. “While the allegations made against Oren are to be taken seriously, we are confident once all the facts and the truth are made known, all will come to understand as we on the Board of Governance believe, that Oren has acted at all times with absolute integrity and always in the best interest of Ecclesia College,” the letter says. 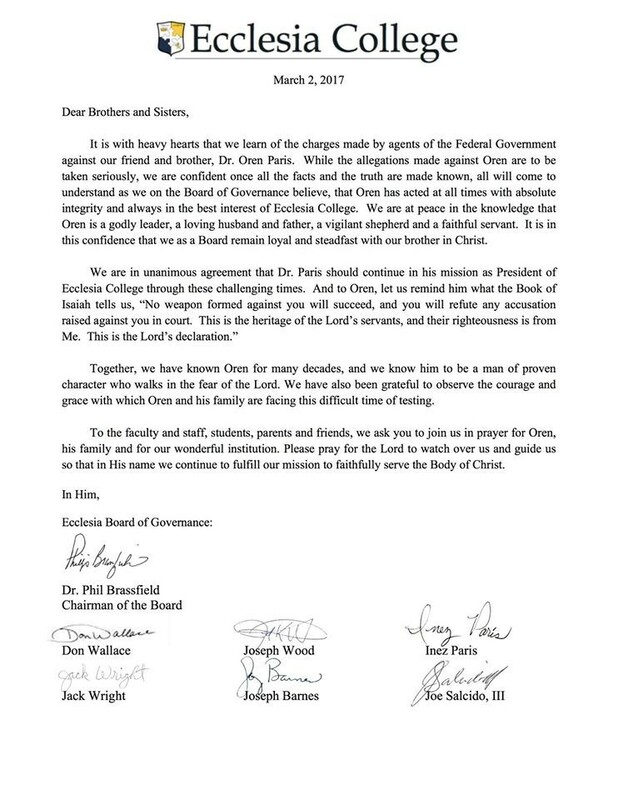 Remaining “loyal and steadfast” with their “brother in Christ,” the board quoted scripture in their show of support for Paris and their wish to see him remain as president of the college. “Isaiah tells us, ‘No weapon formed against you will succeed and you will refute any accusation raised against you in court. This is the heritage of the Lord’s servants and their righteousness is from Me. 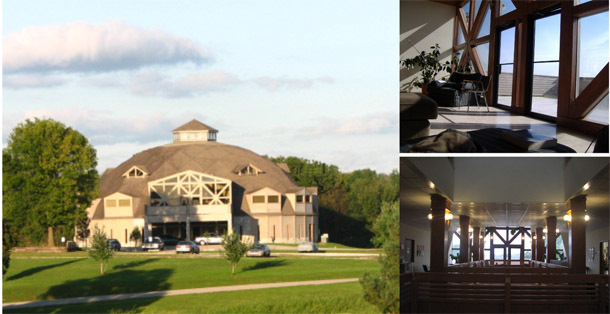 This is the Lord’s declaration,'” wrote Phil Brassfield, chairman of the college’s board. Neither Neal’s sentencing date nor arraignment dates for Woods, Paris and Shelton have been scheduled. A representative from Ecclesia College did not return a call for comment.